TenPoint’s revolutionary Stealth NXT is worth every hard-earned penny. Here’s why. By now, your pre-season deer preparations should be well underway. Checking trail cameras, hanging treestands, mowing food plots and trimming shooting lanes, you hope, will culminate in one epic moment this fall when your well-placed shot subdues a giant buck. The question is this: Are you ready for that shot of a lifetime? 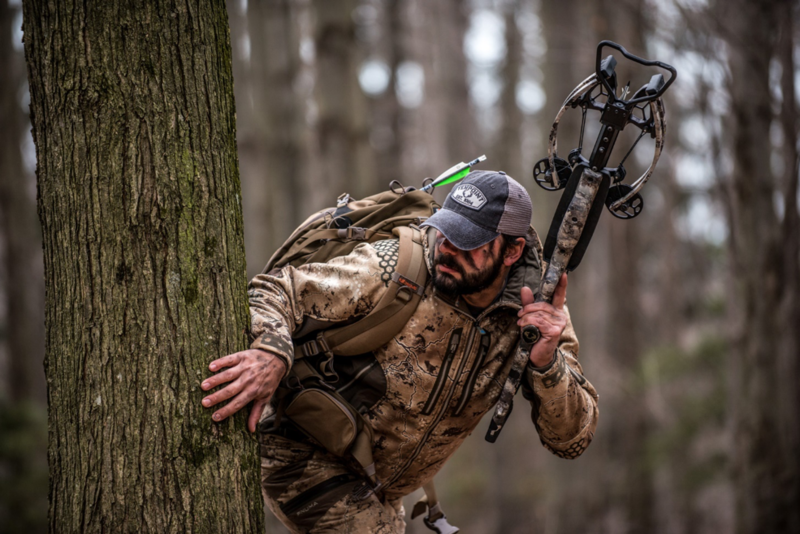 If you’re focusing solely on your approach and little on proficiency with your weapon, you’re leaving this fall’s moment-of-truth opportunity to chance. 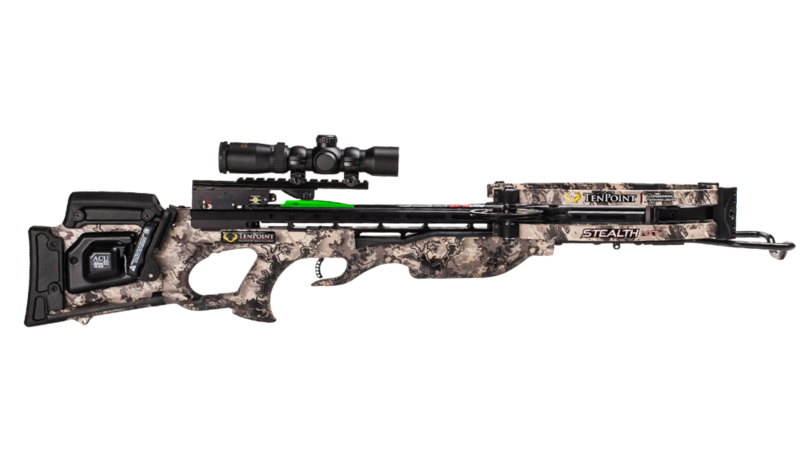 Now, perhaps you’re shopping for a new hunting crossbow before the fast-approaching 2018 whitetail opener. With time ticking, it’s crucial to choose a make/model that sights-in fast and produces repeatable accuracy. That’s the definitive edge TenPoint delivers in its pre-assembled and bore-sighted Stealth NXT. Mounting a crossbow scope and then sighting it in can be tedious. It’s anyone’s guess where the first bolt will impact. And from there, it can take a dozen shots or more just to get zeroed at 20 yards. The USA-made Stealth NXT solves that dilemma. TenPoint bore-sights the included TenPoint RangeMaster Pro Scope (standard package) or EVO-X Marksman Scope (elite package) at its factory to 20 yards, saving you time and hassle. This immediately puts you on the target at 20 yards. Since every hunter shoots differently, a few minor adjustments might be necessary to fine-tune the rig out to longer ranges. Piece of cake. It’s common knowledge that a razor-sharp broadhead placed correctly, even at a low velocity, will cleanly and efficiently kill most big-game critters. However, there are merits to a high-velocity weapon. TenPoint’s Stealth NXT launches bolts at speeds up to (are you ready for it?) 410 feet per second, which equates to a mind-boggling 144 foot-pounds of pure kinetic energy. This velocity-and-energy combination is the product of the powerhouse RX6 Cam System, which features 340-degree cam rotation. Is 410 fps necessary for deer hunting, you wonder? Let me argue a few reasons why I say it is. First, unintended bone impacts hinder penetration. But, a heavy bolt/broadhead combination powered by the Stealth NXT will likely shatter bone on impact. Second, a bolt traveling at 400-plus fps has only a slight trajectory variance from 20 to 40 yards, reducing guesswork in cases when operating a rangefinder isn’t practical. Third, a fast-flying bolt reduces the time a critter has to react, hopefully reducing marginal or spine shots. I firmly believe that high velocity at the expense of noise and shock is worthless. Fortunately, TenPoint has designed the Stealth NXT to thwart shot noises and vibrations via its Integrated Sound Dampening System. In fact, TenPoint claims the Stealth NXT is “3x quieter than the competition.” Amazing. 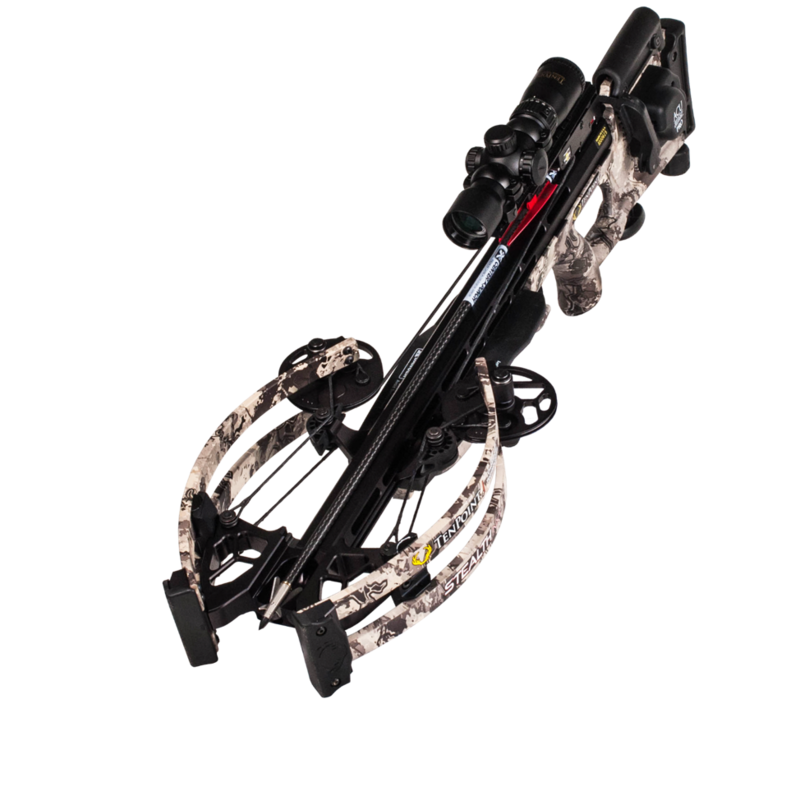 Another contributing factor to this phenomenon are the beyond-parallel limbs, a design first introduced on vertical bows that cancels out limb vibrations. This, combined with its high velocity, again means deer have little chance to react before impact. Accuracy, beyond all, is a weapon’s most important attribute. The Stealth NXT features a 4-cable system, which eradicates cam lean — an otherwise-common hindrance to broadhead accuracy. This, coupled with tight tolerances, premium accessories and breakthrough technologies, makes it surgically accurate. Gone are the days of clunky, cumbersome crossbows. The Stealth NXT is the narrowest TenPoint model yet, measuring just 6 inches wide between the axles. And, it weighs just 7.3 pounds — the same as or less than your favorite deer rifle. This makes negotiating through brush or shooting from tight quarters a slam dunk. It shoulders fast, which speeds target acquisition, and it features an oversized fore-end grip that keeps fingers below the rail. In summary, the most skilled deer hunter is only as deadly as his/her weapon. 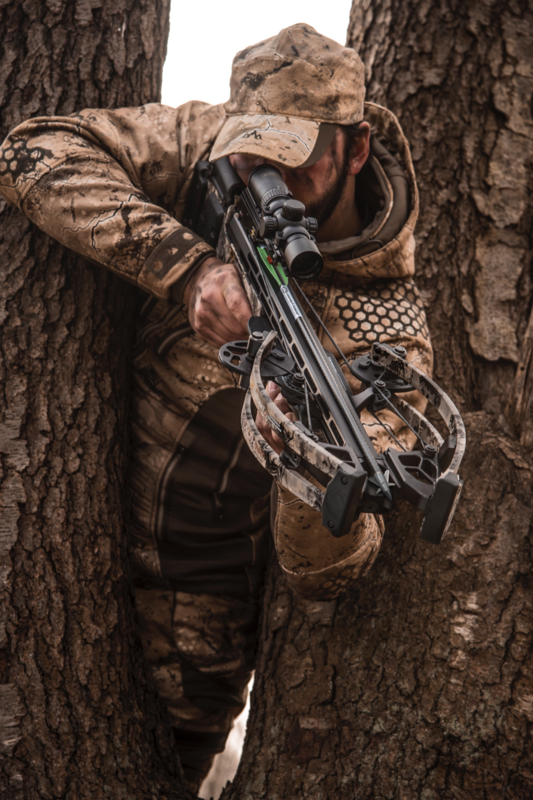 Why not bolster your woods skills with a high-end, high-performance hunting crossbow? 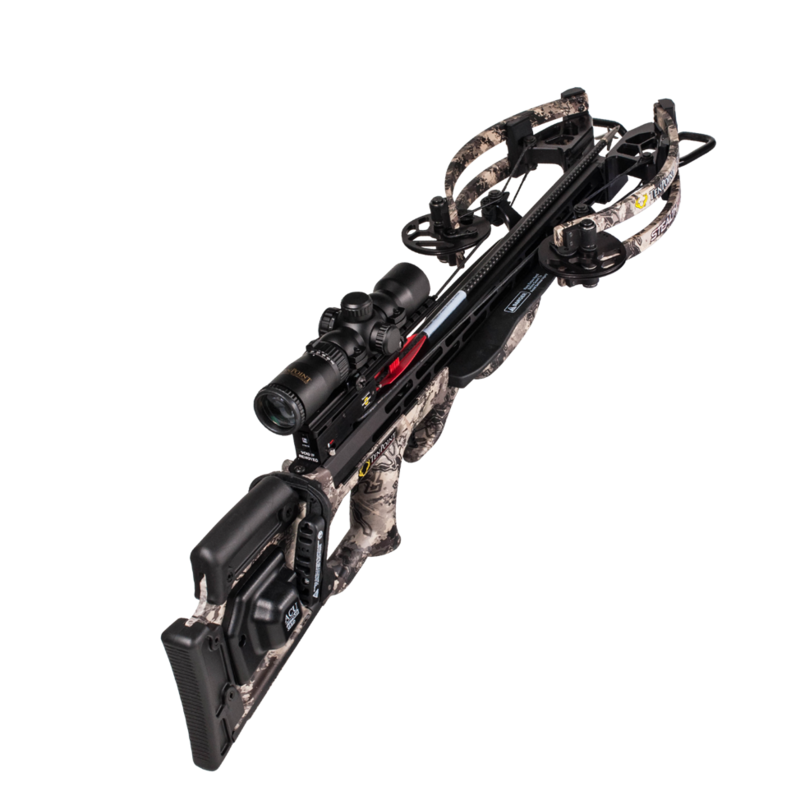 Make it a TenPoint Stealth NXT, and we believe you’ll have no regrets when a monster enters your reticle, for it aces every standard by which a crossbow can be judged.